This article came at a perfect time for me. I had a really difficult day today, and I desperately need the encouragement to create a better tomorrow. I’m drowning in a couple realities that I’ve been afraid to face, and feel I’ve buried myself way too deep in denial. But there’s enough here to read over and over, as many times as needed, to assure myself that I can overcome them and make progress again. That’s actually the thing I appreciate most about your website and your book – reliable, positive sources to reference online and offline when I lose my perspective. Thank you for this post. Just the right words as I start a new day. My two cents: Every day I remind myself to breathe. To pause at least once and look around. Life can be hectic, but I don’t have to be. Knowing this helps me. Every day I remind myself: Today, focus more on those who love you, and don’t give priority to those who are never there by your side. It’s about keeping the important people on the top of my mind. Number 7, remembering to try kindness first when you really want to be angry, is one of the most difficult things for me to live by, but it’s also been one of the most important. To the one about choosing to have a good day and then making it so, I would add a suggestion that you try to first spend most of your time conscious (because we stay on auto-pilot too much) and then try to be thankful or happy or just generally in a good mood more often than not. If you can make 51% of your day positive, then it was worth living (and the other 49% will be that much easier). “Today is another chance to get it right.” – Sometimes when I am in the throws of my lonesome China ex-pat life and I need an attitude shift… I find if I meditate and breathe for ten minutes my day looks a little brighter. I find that having a little list of to-dos and checking them off helps me to see that I am making progress towards my goals – even the little jobs (like getting the ironing done or getting an application off, or booking an appointment) are contributing to something bigger and I am not leading an unproductive life. Nice, useful tips as always! My contribution: Always consider the big picture of life when starting a new day. It’s easy to get caught up in your current problems and worries, letting them take up all your focus. Instead, try to think beyond your current situation, and picture life as a whole. I find that this has me treating problems very differently, and with a clearer perspective, than I normally would. I just have to say: you guys rock! It’s so wonderful to wake up and receive an email like this from you – perfect and filled with useful wisdom. Thanks for all that you do. One thing I would add for myself, ‘Stop dwelling on the person I was 5, 10, 15 years ago…I’m robbing myself of enjoying the 36 year old me. I feel some women constantly regret their birthdays and that doesn’t allow you to enjoy yourself today. Enjoy your 36 year old self. Celebrate her’ That would be my #13 on this list. Another fantastic & precise delivery from the M&A team. Bravo! I’d add that it’s important to know that we have more love coming at us from the “other side” than we could ever imagine. Sit in silence and connect to all the loving beings occupying the great unknown on a daily basis. This could not have come at a better time. I woke up with anxiety out of control. Just this simple email helped me to put things into perspective. Thanks so much for the reminders. Life, can be a roller coaster, with the ups and downs. It’s about embracing both and moving along with it. Finding God in your life and meditating on his words and putting full faith upon him. Sometimes… we start to neglect those who we cherish most and focus on other priorities like work or the circular entertainments in life. Which implies we all have a soul, a soul that craves for something to live for, people to impress, goals to accomplish. So why are we doing this? We’re all searching for something our hearts desire, a deep dark secret. As we take a step back and look at life, a storms clears, you hear the birds chirping merrily, sound of traffic, gossiping, shouting, wind blowing… But then spiritually you’ll hear God. He is close, very close, sitting beside us, holding our hands, embracing us into his arms. He pulls us near and caresses our sinful heart. We stop, open our eyes… we do not see him. Because he lives within us, he is love, he is full of grace, he is inside us. So that we do not have to go looking for him, he has already found us. So my message is to embrace life and to cherish everything in see, smell, hear, touch and feel because you never know when would be your last. “Life is not a wish granting factory, nor should we ever fear oblivion.” Learn to love life as much as possible, soften your hear and invite grace in. I need this at this very moment.. thank you for this kind reminders.. I love Gracie’s message above. With God in your life, and believing that he is there for you always, makes life more enjoyable . Every single word of #6 is absolutely everything that I needed to hear today. Reading this kept me from making what would have been a terrible mistake. I will treasure that statement and keep it with me always as a reminder to never stop fighting. I used to sing the chorus from “Tomorrow” from the musical “Annie”to myself. Then I realized how defeating that is – never living for today, just for tomorrow. So I changed the lyrics to “Today now, today now, there’s only today now, today is your only day.” My personal reminder that there is no day of the week named Someday. Besides, singing in the morning makes me smile, which is always a good start to the day! Perfect timing… on so many levels. How does it feel to be an answer to a prayer? Thank you. 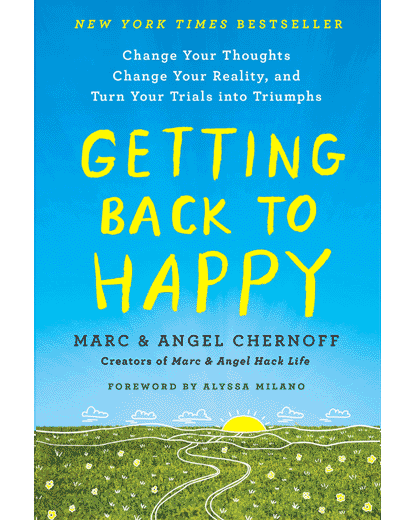 Hi Marc and Angel, I love what you guys write, it helps me a lot. A great insightful post. Sometimes we get so caught up in things that we need to remind ourselves of certain things. It’s great start of the day to remind yourself when wake up. I really could identify with the the point that you don’t need other peoples approval. Sometimes I fall into this trap and value other peoples opinion more than my own. This can be damaging and it can literally ruin your life. Decide who you really are, what your values and principles are and then live by them. Thank you for this post. I needed to read something like this to be reminded that each day is a blessing. I will definitely work harder to not take being hurt personally. It makes sense that people can only give what they have been given. Soo much sense. Thanks again, for this message. I really needed #3 – you don’t need anyone’s constant approval. I feel like sometimes I seek validation more than I should, or I try to explain myself to please others. Sometimes we just need to do things for our self and be confident in that. Thanks for your inspiring posts! This list is a good start. A lot of times these lists make me reconsider how I handle situations (including how i feel about life). I would like to see the next steps, okay life is better than you think (if you are a pessimist/ realist). But what is our next step roadmap. A goal achieving process. Bullies and energy vampires is spot on. They can unfortunately be in your own family, and you finally realize way too late in life, that you are truly better off without them if possible, or at least giving more space. Hi, Angel, that’s a really helpful post. I have been following your blog for quite sometime now and have realized that you and Marc make the best use of some of the best principles from great personalities in your writing which makes it so meaningful and engaging. I’ve learned many things from reading your blog over the last couple of years. From knowing various authors to reading some great books you recommend in your writings, I really want to thank you guys, because your blog has a big part to play in whatever things I’ve learned in the past couple of days. Also after reading your blogs, I started liking literature. Thanks a ton for helping me discover something I truly Love. I love this post. I would add “have a thankful heart and be content in whatever state you are in” to this list. Most people become depressed due to not being thankful as the focus is mainly on what they do not have so they become self-centered. I am thankful that I have a bed to sleep in and a family to laugh with. So, being thankful over the little things can eventually make us a master over the big things. I’ve been really unhappy, but these words are really inspiring. I will try my best to make today a better day. Thank you for your helpful words and messages. Your blog posts make me feel better all the time! A blog post never helped me feel so awake and courageous…Thank U! Number four was very helpful… if you complain, nothing will happen. Do something about your problems… I decided today to stop drinking and it feels so much better to take that step instead of complaining to myself every morning that I drank beer again… thanks for your words! 13. You have home, your own bed, food in your fridge, some money in your wallet, computer, mobile phone. Focus on what you already have and how much could it all mean to someone who has nothing. Thank you. I appreciate this article. Must learn to appreciate the good times so they can last longer. Your posts have become my “go-to” for guidance/support/advice. They always resonate with me and help me refocus on what’s important in life. This post is one of my faves! Thank you, thank you, thank you!! Mornings symbolize a new day, a new hope, a new battle and the tips said in this article help us to be equipped on how we will face a new journey in our lives everyday. There’s a reason why God let us wake up and may we do all the things we could to live up to our purpose in this life. One thing that I have learned from starting a meditation practice is the idea of acceptance of many of the things you cover beautifully in your list. It takes awhile for the ideas to sink it, but it makes such a difference! Great summary for great lifestyle. I would add this last to the list: help people around you. I agree with all of these especially that complaining is useless unless you have a suggestion. It is so easy to fall into complaining and just do it because it is the easy way out. It is so important for your mental health in the long term though to shift your perspective from a complaining one to a more positive one. You are right that today is a blessing. Thanks for the encouragement. Lovely post. #7 and #9 are especially poignant to me. My only addition would be to rely on God and remember his unending love. Thank you for these words! I’m so glad you mentioned #3, that we don’t need approval from everyone all the time. I’ve found that one to be difficult, especially for people that are doing their own thing. Great post! Great article… It definitely makes me feel a little better! Awesome. Really enjoyed this list and it is so true. We really have great power in choosing how we respond to our circumstances, even when we cannot control all the circumstances in our lives. This was a great reminder! I truly believe in all of the above 12 steps toward living a happy life. I would also add 1 more thought: I also believe in giving from the heart without any expectations. By doing this…we give (in whatever form that is) for the pure joy of just giving… to hopefully help enrich another life in some way. By doing this, we bring ourselves closer to our purpose of loving one another… and making a positive difference in the world. Hi, this is another wonderful post. I really love reading your articles. They always makes me feel motivated and inspired. True indeed that getting another day to breathe, to experience life, and to do something meaningful is the greatest gift one can receive. Thanks for sharing. Great Post! Everyone, thank you so much for the contributions to the list. Marc and I just read through every one of your comments, and as always, you continue to inspire us. Thank you for all the insightful contributions to the list (and the kudos). If things look bleak, I try and remember to find beauty in every day things. There’s beauty in a leaf, a cloud, a puppy, a weathered piece of wood or a freshly cleaned store window. Looking for beauty in nature or everyday objects usually keeps me focus on the positive instead of what is not or will not be or should not be. Really enjoy your blog. Thought provoking! Thank you!